Every good backpacker knows that they will need some sort of pack towel while on a trip. Pack towels can be used as multi-use items and are quite a pleasure to have around. They can be used from everything from wiping sweat from my brow, to drying off after taking a quick bath in the stream, as well as cleaning/drying cooking items, and even wiping down my tent before I pack it up in the morning. (And trust me, this is just the beginning, there are many other uses…) And of course, there are quite a few different pack towels to choose from, with the cotton bandana probably being the most common one. Although, there are quite a few specialty pack towels out there. Some are quite technical whereas others are more simple. What is the difference between this and the other towels in the outdoor market? Lightload Towels are much more absorbent than microfiber and cotton. They also are more versatile and pack down smaller. Not to mention, these towels are quite inexpensive when compared to some of the microfiber towels. So, I decided to buy two of these Lightload towels, one for me and one for my wife, to try out while on a 2-1/2 day hike in the Smokies. When they got here I was immediately impressed with the tiny packed size. Each towel was individually packaged (smashed) between 2 paper sleeves with a plastic wrapper holding it all together. 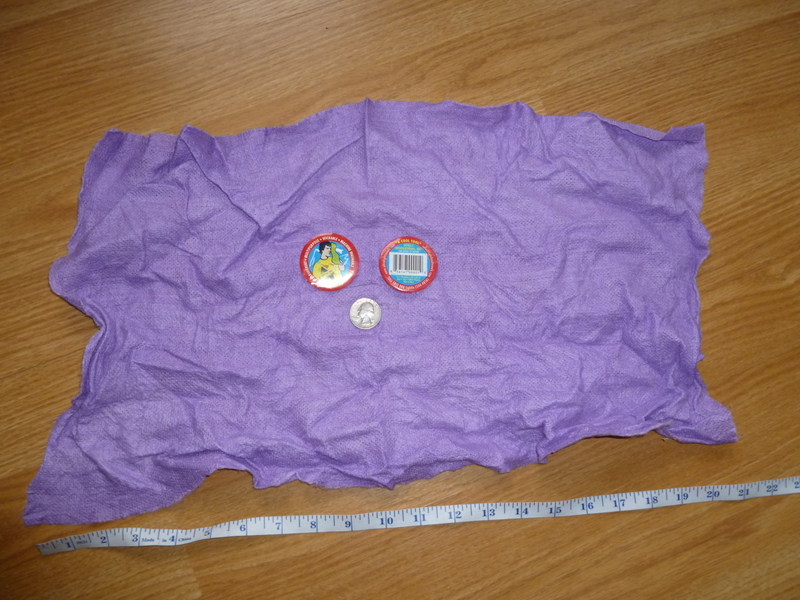 The packaged towel measured about 2″ (5 cm) in diameter by about 1/2″ (1.25 cm) thick and weighs 0.6 oz (18 g) according to my scale. Of course in the above picture the towel doesn’t quite reach the 24″ (61 cm) measurement, however, if it were stretched out flat it would actually go just a little over the 24″ (61 cm) mark. The towel above has been washed and now its natural state is shriveled up a little. Initially, when I unwrapped the towel I had to pull on it fairly hard and was actually afraid that I may tear it while unraveling it from its packaged state, but in the end, it came out fine. Immediately after unwrapping it, it felt a little stiff and a little scratchy feeling against my skin. I simply wadded it up a few times in my hands and it softened up. I also found that by adding a little water to it would help it soften up considerably. As far as durability is concerned, the towel reminded me of simply a heavier-duty paper towel, or one of the blue mechanic towels. Because of this, I decided that I didn’t want to use it for anything “heavy-duty” such as washing/drying dishes or wiping down my tent, but rather to simply wipe the sweat from my face or neck. Although, in a pinch I see no reason why these towels could not accomplish these “heavy-duty” feats, however, in my opinion, using it for tasks such as these would greatly shorten the life span of these towels. Over the course of my hike, I carried the towel in my hip belt pocket on my pack rather than hanging it off my pack. This way it was protected from being snagged on a passing limb or any other such thing. And like I said, I only used the towel to wipe sweat from my head, or to wipe my nose and for these tasks, it did great. It held up well over the course of the trip, and I was very happy with it. 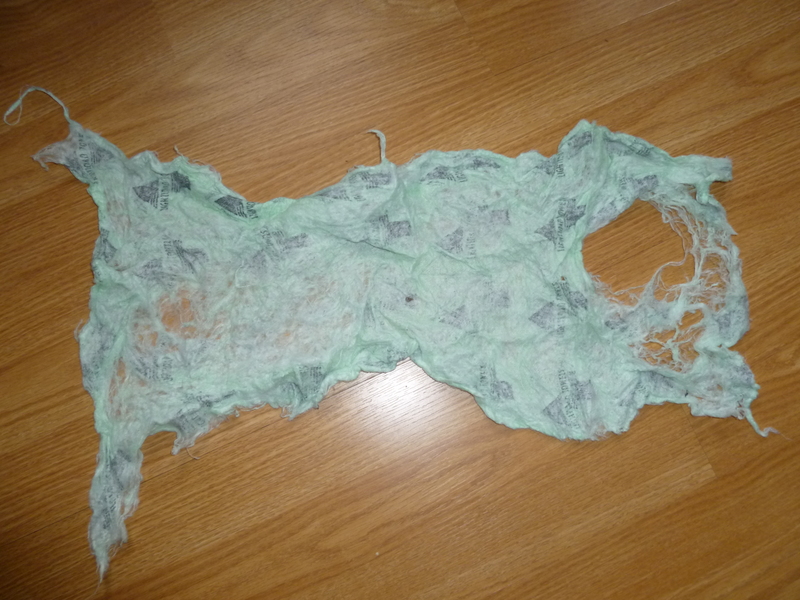 Obviously, this towel is now at the end of its life span. The only good that it is to me now is that of being a fire starter, however, I have no desire to carry this as simply a fire starter, so it will go straight to the trash (a good thing is was so inexpensive). After she saw the results of this one, she approached washing out the 2nd towel a little different. This time she simply put it in the water and lightly massaged it (no rubbing) for a moment and then gently removed it, rinsed it out, and then lightly wrung it dry. The purple towel seen in the pictures above are the results after this washing, and as you can tell, the towel is still fine. Actually, it is very soft too. It will still be able to be used though, at least once more. Regardless off how the first towel washing went, I am still happy with the towels. They are indeed lightweight and very versatile. However, it’s hard for me to say that they do in fact absorb more water than a microfiber towel does, and I would also have a hard time saying that they also dry faster, although, I haven’t tested the two side by side (not to mention that there are quite a few different versions of the microfiber towel available). Also, the Lightload towels are quite inexpensive, up-front. The microfiber towels are more expensive than the Lightload towels, but maybe for a good reason, the microfiber towels will obviously last longer. So, after purchasing a few of the Lightload towels, I would easily spend the same amount as I would as if I were to buy a microfiber towel to begin with. The durability of the Lightload towels vs the microfiber towel, in my experience, is no match. The microfiber towels will undoubtedly last much longer than a Lightload towels. I would say that the Lightload towels are lighter than the microfiber towels, however, there are also quite a few microfiber towels that easily rival the weight issues. So, in the long run, I think that I will probably stick to using the microfiber towels, especially for longer hikes. However, for shorter hikes I see no reason why the Lightload towels would not be ideal. I still wouldn’t mind getting a few more to keep around for just in case. The Lightload towels would make a great item to give to a buddy that wanted to tag along on a hike with you but didn’t have anything. So, do you have a Lightload towel? If so, leave a comment below and tell me what your experience with them are. Disclaimer: I paid for these Lightload towels with my own money. They were not provided to me, and I am not obligated to write about them. This entry was posted in Gear, Pack Towels and tagged Backpacking towel, cotton bandanas, Lightload Towels, microfiber towels. Bookmark the permalink. google searches that shows the towels shredded. Do a google search for lightload Towels and you will see. Im sorry you had a bad experience with the wash but this is not the case if you follow our care instructions which is to wash in a pocket or laundry bag. The towels arent meant to last forever but they do wash.
We will be happy to send you some new towels for you to try out. In exchange we’d be grateful if you could remove that image. 1. You did not read my post. 2. That seems a bit dishonest that you would ask me to take down (read: hide) the picture. 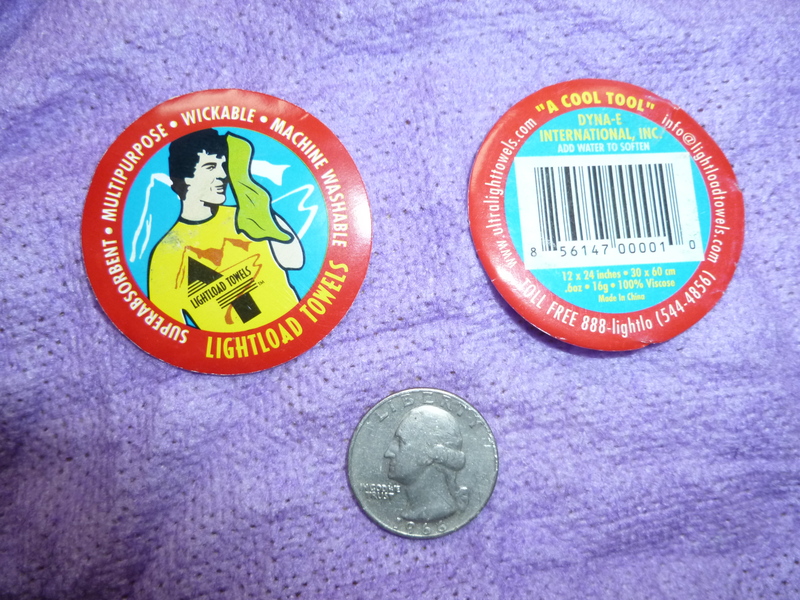 If you have read the post, you will see that I never claim that the Lightload towels are bad towels. In fact, I show 2 towels after washing, one that was simple massaged in a sink of water and then left to dry (which turned out fine), and the other that was gently rubbed together in the same water (and obviously did not turn out fine). Due to this, I find that it is a very legitimate picture to have available because it is an example of what not to do with these towels. Also, I would like to add that (as noted in the disclaimer) I paid for these towels with my own money, so I was free to do with them as I pleased. Now, saying that, I did not intend to have one become so tattered so quickly, and I learned a lesson. Within this post, I hope to pass that lesson along to others so they do not make the same mistake. For this reason, I am even leaving your comments up, so that others can read them and make their own decisions. Either way, I hope this has cleared things up for you. I just did a search for lightload towels and came up with this destructive image of the towels on the home page after a wash. I know lightloads are a great towel and have many thousands of happy users. The blog is very nice and says some nice things about the towels but somehow the very negative image made center stage in the search results. Stick needs to understand that lightload towels to be washed needs to be loaded in front loader not a machine with an agitator(middle arm). The towels can also be put in a laundry bag to wash. I hope he can take that image down and show the towels after being washed in a front loader or hand washed. Anyway, I hope this helps some. And again, I believe that the review is fair, and as you mentioned, it states the good, and the bad points, of these towels. For this reason, I have no plans of altering the review, or removing any photos, or trying to hide what happened. You need to treat this towel completely different to the micro. The micro’s are strong and made to last. The light loads are not made to last and need to be treated with a great deal of care. They are light weight and that’s the benefit. At the end of the day they are so cheap that you could replace them after every trip if necessary. It’s probably cheaper than washing them when you take the cost of detergent and electricity etc. I have a light load towel and have used the same one on about 6 treks. I think they do absorb more water than a micro and i think they feel as though they are doing the job better. I have always put the dirty towel in the washing machine for 15 minutes on a low temperature without any problems. It’s still as good as new. I have recommended these to a few other people also. Thanks for the input! Sounds like a very good experience. I am curious to see how well the towel we have that turned out ok after the wash turns out after a few more uses. I am still afraid of wringing them out and tearing them though. I can really twist my microfiber towel up hard with no worries. After handling the Lightload towels I didn’t feel that comfortable with treating them as harsh. After our next use though we will throw the same one in the washer to see how it does too. We have one of the HE washers that doesn’t have the agitator in the middle so it will be an interesting experiment. I still wouldn’t mind getting a few more to try out some more, but I think that for long hikes (such as my thru I am planning) I will stick with microfiber towels.